I know that I’ll never forget the one and only basketball game I attended this season – it was unforgettable; it was wonderful; it was the moment that I not only met, but was licked by Jonathan the Husky. I should be more distraught that we lost the game in the last few seconds, but honestly, meeting our mascot is one of those rare experiences that everyone wants to desperately check off their list before they graduate. Being in a PhD program, I still have years to go, but at least the only thing that can prevent me now is failed experiments (knock on wood that won’t happen). Although our men never made it to the NCAA tournament, our women are going for their third consecutive national title. Retrospectively, I probably should have made sure I had a clean UConn t-shirt to wear tomorrow in support. Between teaching, class and research, I can’t afford to take the time off to attend the game, let alone actually be able to manage the cost of travel. 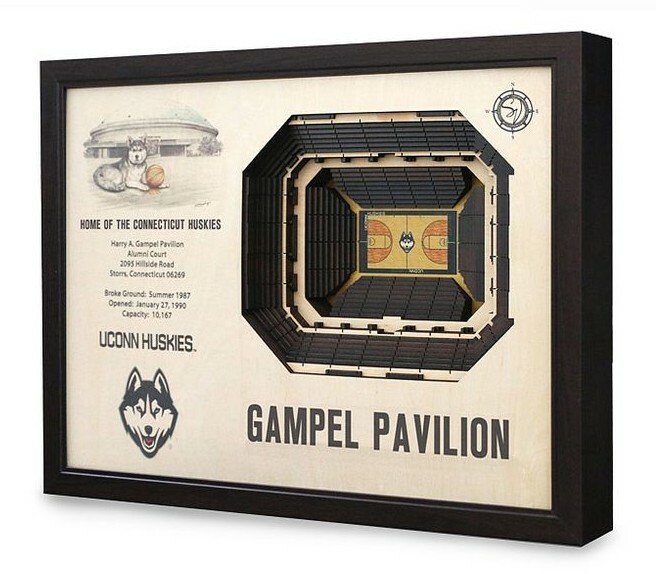 I can pretend that I’m at a basketball stadium, thanks to UnCommon Goods basketball stadium art. So tomorrow night, I will proudly be supporting our UConn Lady Huskies as they challenge Notre Dame for their third consecutive title. U-C-O-N-N, UCONN, UCONN, UCONN!